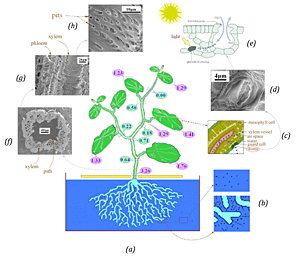 Within-plant sciences and plant production systems, nanotechnology has great potential. In plant nanotechnology, these flowers have a secret signal that is tailored specifically for bees so they know where to collect Nectar. And new research has just provided us with a better understanding of how this signal works. Nanoscale patterns on the petals replicate lightweight in a very method that effectively creates a "blue halo" around the flower, helping to attract the bees and fecundate them. Plants are actually full of this kind of "nanotechnology” that enables them to do all kinds of amazing things, from cleaning themselves to generating energy. And what's more, we might be able to use them in our own technologies by studying these systems.